It’s about creating a bond between the driver and their car. The Mazda MX-5 has always been about that connection; that love of driving. It’s the purist’s sports car that has set the bar for a thrilling experience where you never want to get out of the driver’s seat. The 2019 Mazda MX-5 gives you even more of the passion for driving. A modest revision this year adds more power, more technology, and a splash more style. Here are five things you’ll love about the 2019 Mazda MX-5. You’ll find the 2019 Mazda MX-5 in Yarmouth at your local dealer in the Maritimes, Yarmouth Mazda. A cohesive appearance is the goal with KODO, Mazda’s Soul of Motion design philosophy. For 2019, the Mazda MX-5 is available with an all-new soft top that complements the MX-5’s KODO. It’s such a natural, organic look that is simply looks like it belongs; that the Mazda MX-5 has always had a brown soft top. It’s not the only appearance change for this model year however. Two new wheel design are on display – black metallic 16-inch and 17-inch wheels. While it’s always about an absolutely exciting driving experience, not power, a bump in horsepower is welcome for the 2019 Mazda MX-5. Through several small modifications, engineers have unleashed 17 percent more horsepower, from 155hp to 181hp. Torque also increased from 148lb.-ft. to 155lb.-ft.
Minor weight reductions on the pistons and connecting rods, a dual-mass flywheel, larger fuel injectors, and changes to valve opening angle and intake ports made the power increase possible. Yet, while the power production increased, fuel consumption decreased for the 2019 Mazda MX-5. It’s the best of both worlds. 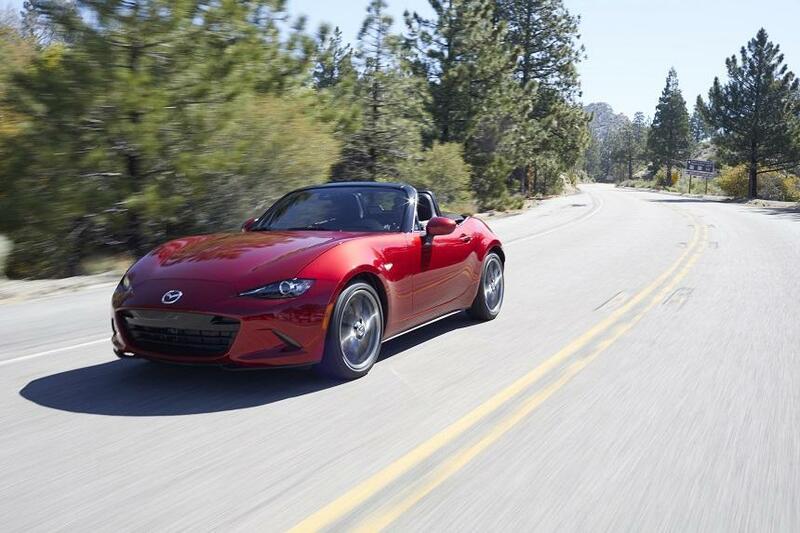 Since safety is always paramount, the 2019 Mazda MX-5 makes strides toward protecting the driver and passenger even more. The new MX-5 contains more standard i-ACTIVSENSE features than before, spread across the trim levels. Two new i-ACTIVSENSE features that are available for the 2019 Mazda MX-5 are Traffic Sign Recognition and Smart City Brake Support. Both tools help you stay protected while you’re on the road and are optional for 2019. 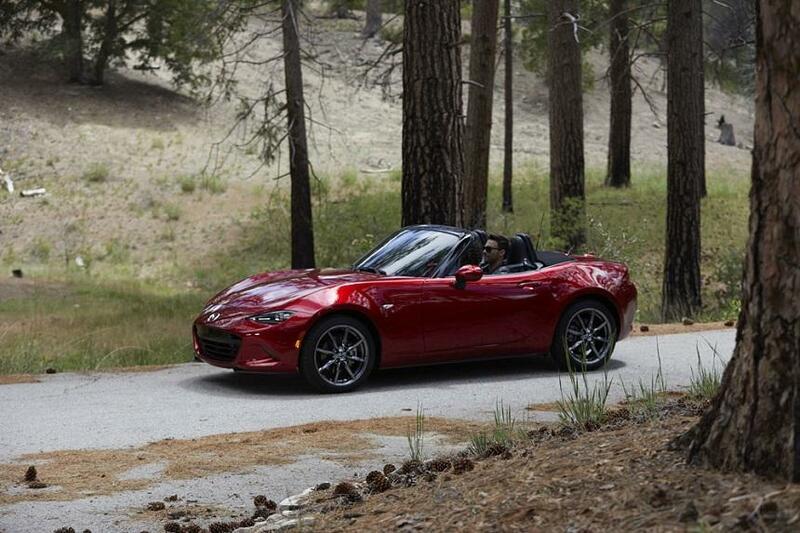 Visibility can be challenging, even for a compact convertible sports car like the Mazda MX-5 2019. That’s why Mazda includes as standard equipment a new rearview camera. Pedestrians, objects, parking lines and markers – they’re all clearly visible behind you with Mazda’s rearview camera. For a seamless, flowing interaction with your Mazda MX-5, Mazda has made positive changes in a few key design areas. Entry is improved with easier-to-open doors and revised door stops. Cupholders and seat levers have been modified also, giving a more ergonomic feel to the interior. And when you’re behind the wheel, you’ll find a more comfortable seating position with a telescopic steering wheel with 42mm of travel. The same passion is obvious, but more intensely, in the 2019 Mazda MX-5. With new features and better performance, there’s never been a better sports car for the purist. In Yarmouth, NS, you’ll find the 2019 Mazda MX-5 available this summer at Yarmouth Mazda.